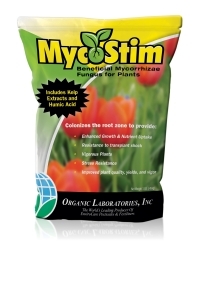 MycoStim is a natural-based biological soil and root inoculant with beneficial root colonizing fungi adaptable to a wide range of soils and environmental conditions. These fungi increase the root’s ability to take up nutrients and water resulting in a more vigorous and stress resistant plant – especially when establishing a new plant to the landscape. Dusting the roots of a plant with MycoStim before transplanting will help prevent the loss of the plant from transplant shock, increasing odds of survival by 90%. Flowers are more abundant and vegetables are higher quality too! MycoStim can be dusted on the roots, sprinkled in the hole, mixed with seed or mixed with water as a slurry.